In TFG Sports fifth year as kit manufacturers for the Club, their new Away strip design for the 2004/05 season was very simple, being nothing more than a polyester white shirt - with a strange cloth like texture - complete with a round black collar, and black trim at the cuffs. There was an additional tangerine stripe running diagonally across the front of the shirt, broken only by the Morning Noon & Night logo, who had continued their sponsorship from the season before with a new two year deal that was worth over £600,000 to United. The white shorts had a tangerine flash from the hip on both sides, and were accompanied by white socks with black trim. 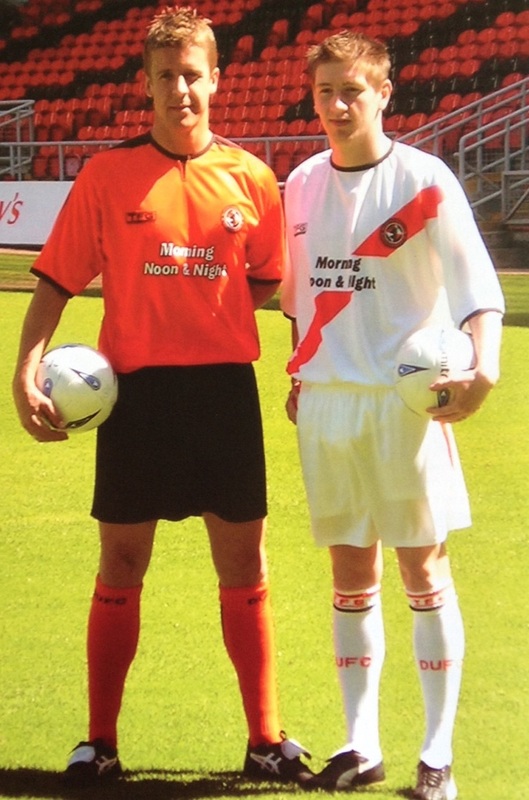 The "sash" kit was not seen until the away trip to Motherwell, where United lost 4-2 in September, and as usual was also used for the trips to Pittodrie, Tynecastle and Almondvale. The kit was only kept for the one season, as United struggled to fight their way out of the relegation zone, with manager Ian McCall being replaced with his assistant Gordon Chisholm in March. Since its announcement in 2000, United had been continuing with their Centenary Collection. The original idea had been to release a new kit every second season redesigned and themed on specific aspects of the Club’s heritage, building towards the Club’s 100th birthday in 2009. So far, the green Away kit of 2000/01 and the black third kit of 2002/03 had been included in the issue, and the 2004/05 season should have seen the next release. However the concept was seemingly dropped in 2004, with the sash Away kit having no relevance to any of United's previous kits, and no other kits were branded with the "Centenary Collection", although there was a Centenary kit released during the 2009/10 season.